Middle-grade readers looking for more Greg Heffley shenanigans are in luck! Jeff Kinney's newest book is an equally silly, just-as-entertaining spin-off of his bestselling Wimpy Kid books. 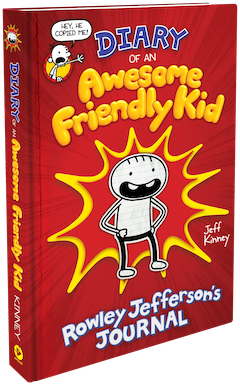 Rowley Jefferson would like readers to know that for his first book, Diary of an Awesome Friendly Kid, he "wrote the words and drew the pictures all by myself without any help from a grown-up" or from his best friend, Greg Heffley. This book, after all, is only about Rowley. Greg has 13 books! It's Rowley time. "I decided to start a journal because my best friend Greg Heffley has one and we usually do the same stuff," Rowley begins. "I should mention that me and Greg are BEST FRIENDS," he continues. Even though readers may be thinking, "Well tell me more about this Greg guy," Rowley's book "isn't about HIM, it's about ME." Rowley has a good life: his mom "feeds me healthy food and helps me keep my body clean"; his dad is his second-best friend; and he gets to walk to school every morning with his first best friend. "Usually," Rowley writes, we "have a total blast when we're together but sometimes I do things that annoy him." The biggest annoyance to Greg is when Rowley copies him. "So I'm probably not gonna let him know about this journal because it's just gonna make him mad." Things take a turn on Day Two of diary-keeping, when Greg finds out what Rowley's been up to. Rowley was right--Greg is angry. Greg says Rowley "totally ripped him off" and that this is a sue-able offense. "Then," Rowley shares, "Greg said it's a JOURNAL not a diary and then he whapped me with my own book." Hurt, Rowley tells Greg he won't write about Greg any more and shows him what he's written so far. Then, Greg says the journal "gave him an IDEA." Since Greg is going to be rich and famous one day, "everyone will want to know his whole life's story." Rowley could be the one to write it! Rowley is in! Rowley's journal, Take Two: Diary of Greg Heffley by Greg Heffley's Best Friend Rowley Jefferson! Biographies are a little tricky, though, as Rowley quickly learns--when you didn't meet someone until fourth grade, it's hard to know what happened in their lives before then. Rowley solves this problem by glazing over Greg's early life with a few drawings of "baby Greg" and then jumps right into "the start of fourth grade." This is when the Greg/Rowley friendship gets good. The two boys met when Rowley showed up at Greg's door telling a knock-knock joke. Greg wasn't interested in the joke, but he was interested in informing Rowley that the house his parents had just purchased was on land in which Greg had planted a flag. Thus, he now owned Rowley's "house plus everything in it." Rowley's dad quickly went over to Greg's house and got Rowley's bike back. More hilarious instances of die-hard friendship follow: Greg makes Rowley squirt milk out of his nose; Greg drops an ice cream cone on Rowley's head; Greg tells a story so scary Rowley wets the bed; Rowley falls into a ditch and gets stung by hornets, thereby saving Greg from continuing to attend a boring birthday party... what fun the two totally equal, empathic friends have! Very occasionally in this journal-shrine to the unrivaled kindness and love that is Greg Heffley, readers are given a story wholly about Rowley. One such story revolves around a family cabin, male bonding, the loss of a grandpa and the fear that said grandpa has come back as a ghost. It's touching--Rowley has experienced loss and understands the depth of that pain--and very funny, depicting a bathing Rowley convinced his grandpa has come back from the dead. It's a nice glimpse into the Awesome Friendly kid Rowley truly is, without the shadow of his Wimpy Kid best friend. Charles Kochman: What Does an Editor Do? We've noticed your name in the back of the Wimpy Kid books. How did you first meet Greg Heffley? Charles Kochman: I first met Greg at a comic book convention a few years ago. He came up to our booth, handed me a copy of his journal and said he was going to be famous one day, and if I was smart enough to publish his book it would sell millions of copies. He was very confident, so I figured why not? Turns out Greg was right. He's now an action figure, has written more than 13 books, been in four movies and is on board games and T-shirts and emojis. I've even seen a Greg Heffley balloon marching in the Macy's Thanksgiving Day Parade! And I think he's sold something like 200 million copies of his Wimpy Kid books in 60 languages all over the world. Turns out, meeting Greg Heffley was the luckiest day of my life. CK: Good question. Don't tell anyone, but I've been trying to figure that out myself for years. Basically, when a writer hands me a book, I publish it. A lot of other people then help make it happen. What was your reaction when the Diary of an Awesome Friendly Kid manuscript landed on your desk? CK: Greg has told me so much about Rowley Jefferson over the years, so it was great to finally hear Rowley's side of all of those stories. I never thought Rowley would want to be a writer, but since he and Greg are best friends, I am not surprised that he copied him. Ever since Greg's first book came out, it seems like everyone is trying to publish their own diary. But I really love Rowley's book. It's funny, and it's also awesome and friendly. In fact, it even says so on the cover! Was it a difficult negotiation? CK: Actually, no. I have a jar of jelly beans on my desk, and when Rowley came to my office he kept asking for more and more of them throughout our meeting. I finally offered him the whole jar and he leapt to his feet, shook my hand and said, "We have a deal!" I was just being polite, and was going to pay him real dollar bills, but Rowley was happy with the jelly beans, so that was that. It was a really easy negotiation. As editorial director at Abrams, you have the chance to work with many talented authors and illustrators. What has it been like working with Rowley Jefferson? CK: Rowley is nothing at all like Greg makes him out to be. He really is an awesome, friendly kid. He's not as good an artist as Greg is (he forgets to draw noses on people), and he doesn't quite understand grammar (I think the comma key may be broken on his computer). But he was so enthusiastic and excited to have his own book published, he was the perfect author. We had a meeting with our marketing and publicity team, and he gave everyone jelly beans. (I think they may have been the same jelly beans that I had given him.) Mr. Jefferson, Rowley's dad, says Rowley is a good sharer, and I can tell you firsthand, he is. You're familiar with Rowley's best friend, Greg Heffley. What's your opinion of their friendship? CK: Rowley and Greg are best friends. Greg may not want to admit it, but he sure does spend a lot of time hanging out with Rowley. The two of them are always talking, always doing things together. 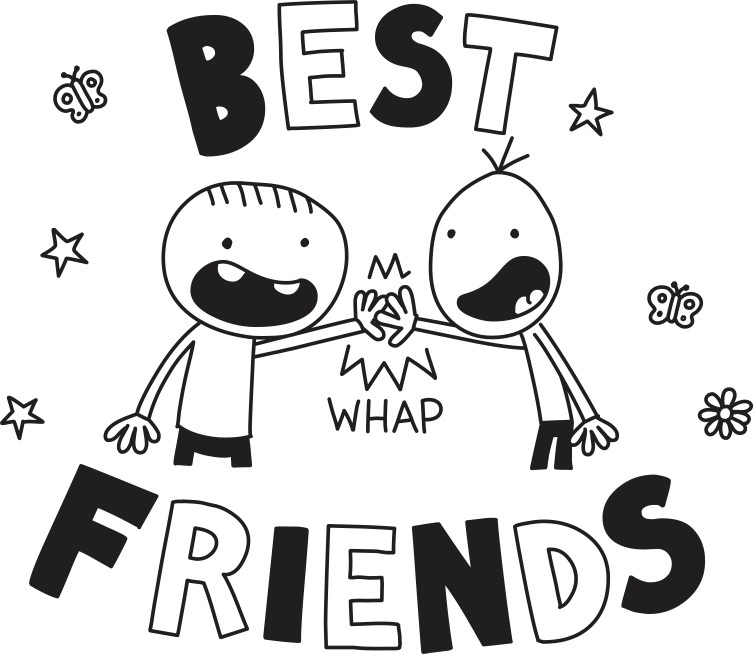 I had a best friend when I was a kid, and we were a lot like Greg and Rowley. We were always playing games and reading comic books together, and sometimes we argued, but we also laughed a lot, especially when we should have been studying. We went to the same school, so we even got to hang out there too. I think the dynamics between kids are all the same, really. It reminds me of my friendship with this writer guy. His name is Jeff Kinney. You've probably never heard of him. What are your favorite parts of the book? CK: Okay, I know I said earlier that I loved the book, but to tell you the truth I haven't read all of it yet. I really should, and promise that I will, real soon. 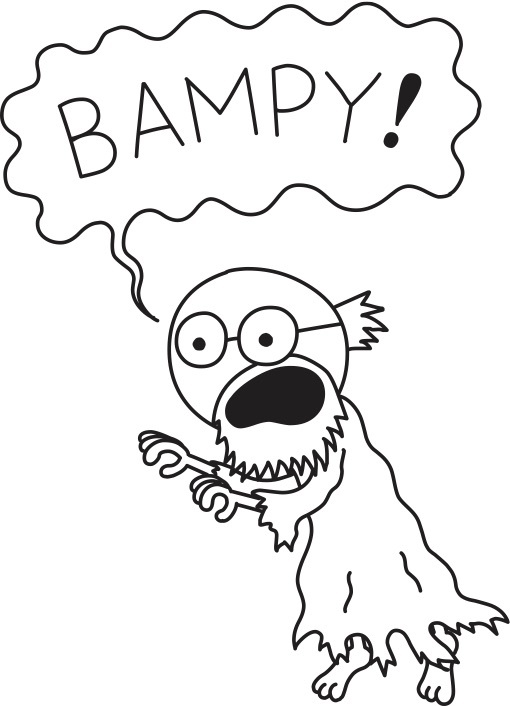 But flipping through it right now I see some really funny drawings, and others that scare me a little, like this one picture of the ghost of Bampy. Thankfully they're not all like that. I see there's a scene with a sleepover and one with a giant rock and another with a teacher. And Abraham Lincoln is also in the book for some reason (I'll have to read that part later to find out why). But there are also some comics inside too. And I really like comics. I have to say, this book really looks great. I like that there are a lot of drawings on every page, because that means I can read it really quickly. How do you think the millions of Wimpy Kid readers will react to this new voice? CK: I think anyone who loves Greg's Wimpy Kid books will love Rowley Jefferson's journal. I read the back cover all the way through, and they really seem to be similar (except for the drawings and the lack of commas). 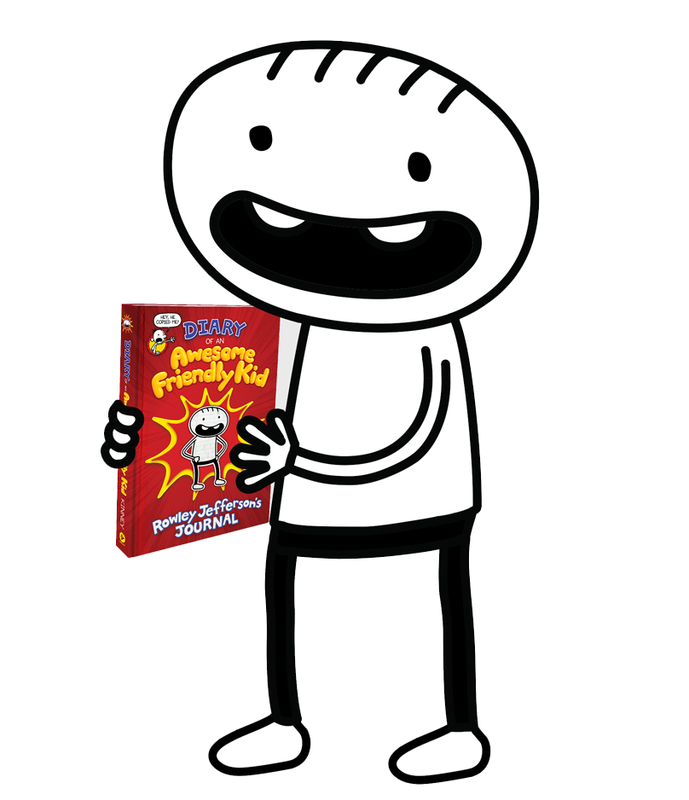 If Greg Heffley could become famous, then I can't see why Rowley Jefferson can't be just as famous. Although I think that will make Greg mad, so I hope he doesn't find out. I'll have to remember to hide the copies of Rowley's books when he comes to the office to visit. And that reminds me, I need to buy more jelly beans. And a new jelly bean jar. Hi, Rowley! Would you please tell Shelf readers why you're chatting with us today? Rowley Jefferson: I made a diary just like my best friend Greg Heffley. I wrote all the words and did all the drawings myself without any help from a grown-up. What made you decide to start writing your own diary--er, journal? RJ: Well my friend Greg did a bunch of journals and me and him are best friends and we usually do the same stuff. But Greg said I'm ripping him off and now he's mad. What did you originally want to include in your journal? RJ: Well at first I thought I'd write a whole book about me and my mom and my dad and maybe put some stuff about my favorite teacher Ms. Beck in there. But then Greg said he had a better idea and that the book should be about him. So my book is mostly about Greg, but don't worry because there's still a lot of Rowley in there too. Why did you start writing about Greg instead? RJ: Greg says one day he's gonna be rich and famous and there are gonna be a ton of biographies about him. So he gave me the chance to write the first one, which just proves what a great pal he is. Nobody knows Greg better than me because we're best friends, and there's a lot stuff that I know that nobody else knows. Like the time Greg wet his pants on our first sleepover. But I decided not to put that in there because I thought it might make Greg mad if people found out about it. Did you have a favorite part about writing Greg's biography? RJ: My favorite part is when we made up our own superheroes. Greg's superhero is named Intergalactic Man and he has a different power in every fingertip. 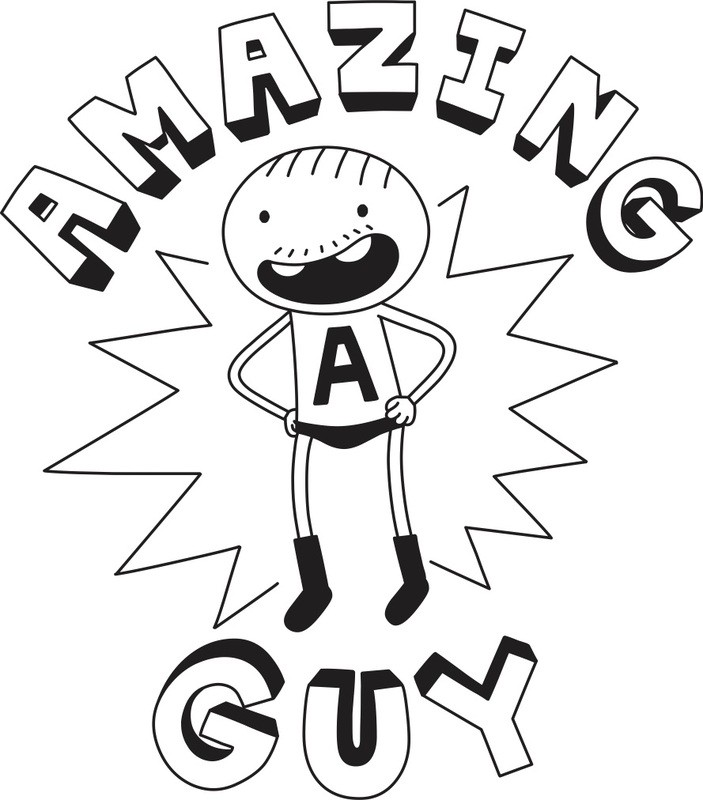 My superhero is named Amazing Guy and his superpower is kindness. And the way he got turned into a superhero was by getting hit by double rainbows. Greg said that's a dumb origin story, but I thought it was cool so I kept it in there. Was there anything particularly tough in writing about Greg? RJ: Well sometimes Greg gets frustrated if I talk too much about myself in his biography. There's this one chapter where I talk about this time when I took a bath in my Bampy's old cabin and then a ghost opened the door and I got totally spooked out. Greg said that chapter didn't have anything to do with him and I should cut it. But I kept it in there because I just had to let someone know about what happened at Bampy's cabin. Why did you also decide to draw pictures for the biography? RJ: Because Greg draws pictures in his diaries and I wanted mine to be just like his. I think my pictures are pretty good, but Greg says I draw like a five-year-old because I don't draw noses on people. But that's just because sometimes I forget to. Has Greg read your book? Did he like it? RJ: When Greg read my book he said he's gonna sue me for ripping off his idea, but I told him go ahead and try because he's not the first person who ever wrote in a diary. Then he said he was calling his lawyer to report me, but I think he was just faking because he wouldn't let me talk to him. Then Greg said I had to get my own lawyer because I can't afford his lawyer. You're a really awesome and friendly kid! Why do you think being awesome and friendly is so important? RJ: Thanks! It makes me happy when my parents tell me I'm an awesome, friendly kid, and I like it when Ms. Beck says that too. Greg always says I'm in love with her and I say that's not true, I just like the way she smells, and I like her hair and her personality. I am glad people like me because I'm trying to be the best Rowley I can be. All images TM and © 2019, Wimpy Kid Inc.